BILAL KHAN and Arieb Azhar LIVE In MULTAN! 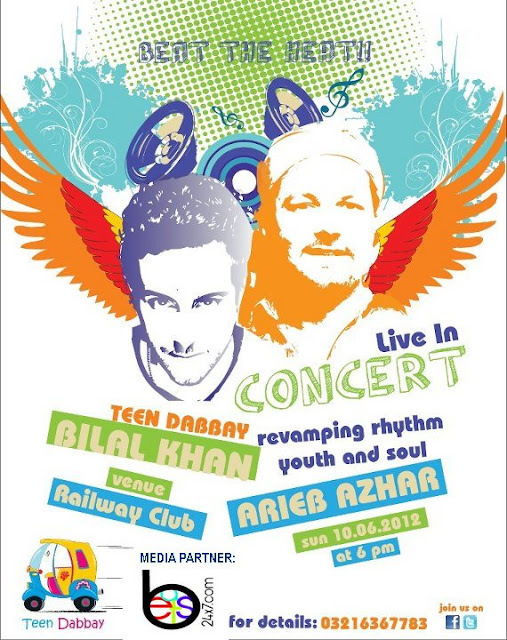 BILAL KHAN and Arieb Azhar LIVE @ Railway club (Beside KFC) in Multan on 10th June 2012!
" Beat the Heat with Rhythm"
- Lamha and Many More. The Coke Studio Sensation Arieb Azhar will also Amuse you with his Pakistani Sufi & Folk music which will touch your soul. You all can now get the tickets from all the KENT DRYCLEANER branches and SUBWAY(Executive Only).